It’s Day 12 today, and we’re closing out the 1950s! 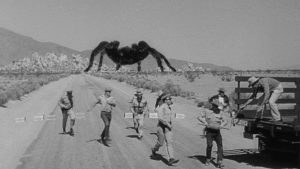 I admit that after reviewing the less-than-stellar It Came From Outer Space on Monday, I watched 1955’s Tarantula with a slight trepidation. I had begun thinking that maybe Creature Features just weren’t up my alley, but thankfully, I enjoyed today’s film about 100 times more. There is still a certain B-movie feel to it (the premise is that a gigantic tarantula is terrorizing the town, after all), but for the most part it succeeds where many other monster movies of this era fail. It doesn’t go over the top with kooky, animatronic creatures and silly sound effects, and the movie is supported at its core by genuinely good storytelling. Tarantula even features a strong, intelligent leading lady in Mara Corday, who, while beautiful, does things to further the plot beyond clutching her graceful cheekbones and shrieking. Imagine that! Let me back up a bit, though, and give you a synopsis. Our film starts out once again in the Arizona desert– clearly, the most hip-happening place in the ’50s for mysterious, unexplainable phenomena. Young and ever-so-slightly oily Dr. Matt Hastings (John Agar) is urgently summoned to the Sheriff’s office to weigh in on the death of a horribly deformed, roadside John Doe. The Sheriff believes the body to be that of missing scientist Eric Jacobs, but it’s nearly impossible to confirm due to the twisted, diseased state of the face. Dr. Hastings is at a loss for answers, and it’s only through eventual confirmation from another well-known country doctor, Dr. Deemer, that they can positively ID the body as Jacobs. Deemer seems to be harboring secrets, but he assures Dr. Hastings that the affliction which befell Dr. Jacobs was nothing more sinister than acromegaly (even though Hastings knows acromegaly is incredibly rare, and usually takes years to advance to this level, not days). As it turns out, Dr. Deemer and Dr. Jacobs were research partners at a remote laboratory 20 miles into the desert. Unbeknownst to the townspeople, they were conducting experimental research into human and animal growth hormones as a way to increase the world’s food supply. It’s almost like the inverse of an egomaniacal Bond villain scheme…and even though it will obviously never work, you have to applaud them for trying. Unfortunately, during a struggle at the lab after Jacobs’ death, a fire breaks out and many of the animal test subjects are compromised. Among these, a tarantula (one of the more advanced-stage subjects of the experiment) is able to escape the lab and flee into the desert, where it continues to grow ever larger and more menacing. I appreciate that the filmmakers didn’t try to BUILD a giant tarantula out of robotics or claymation or papier mache or whatever, but instead used trick photography to make a regular-sized tarantula look huge on the set. It makes the film hold up much better over time. I also thought there was a perfect number of tarantula shots throughout the film–just enough to build suspense and see that it was growing larger and larger (and more bloodthirsty), but not straight-up 80 minutes of bombs going off and the tarantula running amok through the city. It’s a movie largely focused on the events leading up to, and in the wake of, the escape of the giant spider, with occasional cuts to the desert to see what the big guy is up to. I like this approach a lot, and tip my hat to the director for making the call. Okay, let’s talk about Mara Corday’s character for a moment. Corday plays the sultry female scientist, Stephanie “Steve” Clayton, and her performance is fantastic! She arrives on the scene by way of a streetcar named Desire (thanks, Carol Burnett! ), and proceeds to wow her male counterparts with the manly size of her brain. There are several little quips from Drs. Hastings and Deemer at first (“Give women the vote and what do you get? Lady scientists.”), but Steve remains unfazed. She is cool, collected, and well-read; it doesn’t take long for her to win the complete professional confidence of Dr. Deemer. 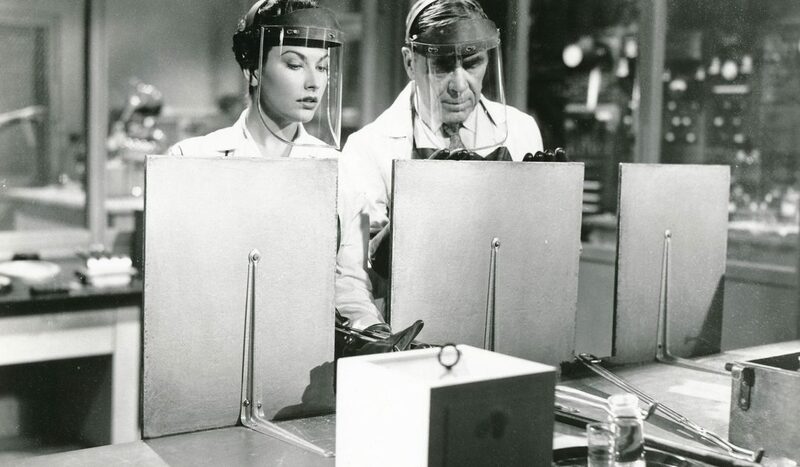 Not only does Steve become an essential part of Deemer’s laboratory operations, but she is also Hastings’ girl Friday when it comes to unraveling the mystery of the tarantula. She seems to be channeling real-life Hedy Lamarr here, and I love it. This movie is definitely worth checking out, and you can do so via Netflix DVD. I’d say it’s among the better-done monster movies of the decade, carried by an interesting (if fantastic) plot, solid acting, and progressive female roles. Let me know in the comments below whether you agree or disagree! Tomorrow, join me again as I review our first movie of the 1960s: House of Usher, starring Vincent Price. I hope you’ve been enjoying our 31 Days of Horror series so far, and that you’ll continue to come back for more during the rest of October!